Hows that for a wishy washy title? Ha. I was suppose to dye my hair a blackberry wine color, but its come out a dark cherrywood auburn/brunette. To be honest, I'm not sure I like it, but I've gotten many compliments. 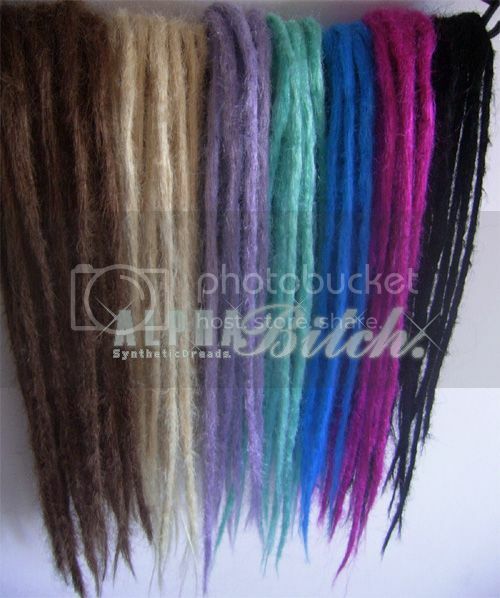 I thought a set of matching dreads might make me more enthused about it. Since I am back and forth on the color, I'm not looking to spend a lot on a custom set. I'm looking for old/used sets or a bunch of accent kits I might want to throw together. Anything in the dark auburn, brunette, red, black, or maybe blonde or orange family as accents. Does anyone have anything they are just kind of looking to unload? pre-made lightly crocheted naturals, never worn, 300HUF/dread. hm. i may take you up on that. I'm having some trouble with my ends fading into a murky green color. I'm going to touch up the color once more next week and I'll see what shade that leaves me. At the moment, its not really brunette or auburn I'd like to stabilize the color to dictate a base. What would you think shipping would be to the US? went camping over the weekend, and the harsh conditions and sun exposure completely faded the color. I'm now faced with very very green ends and a flat tire for my troubles. it was 130 usd to replace the tire, and I'll need to tweak my hair before i attempt anything else. *sigh* its always something, right? Certainly do not hold them for me, but when I get my act together I may see if they are still available. I have been a total hair schizo lately, and very non committal. I went black so I no longer have use. I'm sorry. Haha I understand. I'm the same way. I can't even get sets made anymore because I usually get bored and change my color while I'm waiting. Secondhand only for me now. Lol.